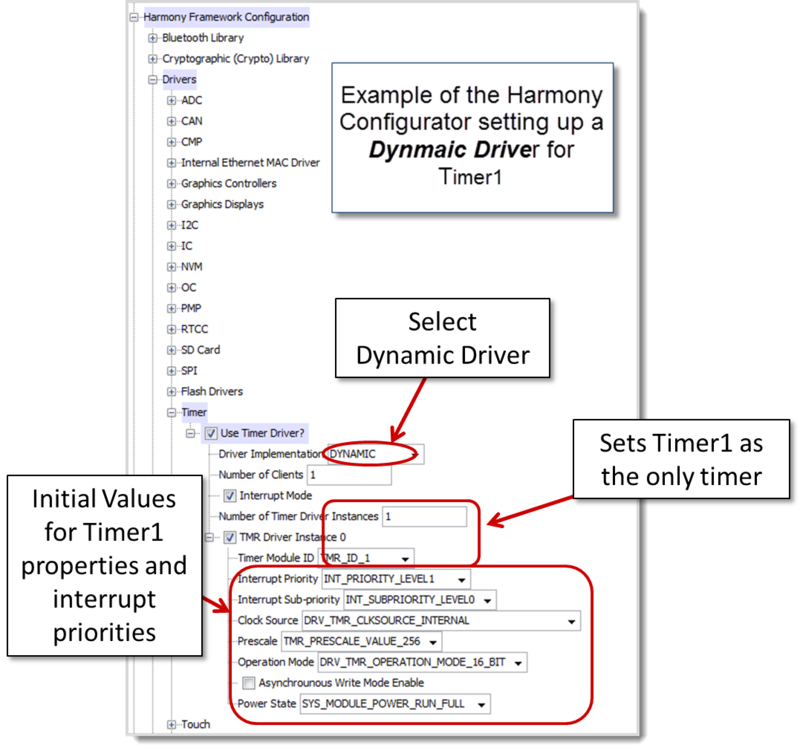 This page illustrates the steps needed to configure a timer and associated interrupt vector using a Dynamic Driver in Harmony. The code example used on this page manipulates one digital I/O pin on each Timer1 interrupt. Verifying the function DRV_TMR0_Initialize() establishes Timer1's operating parameters. Under the "Driver" section check the "User Timer Driver?" box. Ensure the Dynamic timer driver is used. After selecting the driver type you will have the option of selecting the number of timers to be used as well as the setting for each of the timers. Harmony inserts into the function System_Initialize() the initialization code for each timer defined with a Dynamic Driver. The parameters passed to the initialization function include the number of the timer to be initialized and a pointer to a flash based block of data containing the parameters to be loaded into the timer special function registers. The code below shows the initialization code for Timer1 DRV_TMR_INDEX_0 into the first system object (sysObj.drvTmr0). The example below creates a global variable MyHandle to contain the handle for the timer. The data type of MyHandle, SYS_MODULE_OBJ, is defined as a pointer to a data structure containing the status of a timer. DRV_TMR_Open checks the status of the timer and if available for the intended use will return a valid handle. This example generates a simple function, MyISR which toggles an I/O pin. Using DRV_TMR_AlarmRegister, the function MyISR is set as the Interrupt Service Routine for Timer1. The Interrupt Request Flag is cleared by the shared interrupt vector and does not need to be cleared by the user-written ISR. Users typically generate the value for the divider as a calculation based upon the desired interrupt frequency and the returned value of DRV_TMR_CounterFrequencyGet.